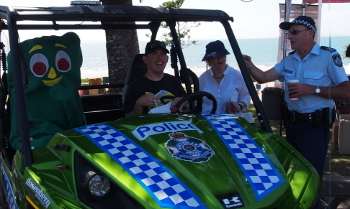 As part of Disability Action Week, the annual Beach Day Out event was held at Yeppoon foreshore. The annual event has been running for several years and gaining increased support and attendance each year. Beach Day Out is a fun day at the beach for the whole community, especially for people with a disability who may ordinarily have difficulty accessing such an event. It includes free activities such as hand cycling, kite making, a sensory room and a fully accessible jumping castle. improve community support for people with a disability. ADCQ's Central Queensland team is part of the steering committee which organises Beach Day Out. Special thanks to the organisations involved in this year's Beach Day Out including Departments of Communities, Child Safety and Disability Services, Community Solutions Rockhampton, Livingstone Shire Council, Capricorn Coast Community Access group, Suncare Community Services, Autism Qld and other supporting agencies. People who go on a pub crawl can be denied access to venues for many reasons, but actual physical inability to access the venue should not be one of them. The Yeppoon Access Pub Crawl was created to highlight this very issue. The annual event in Central Queensland aims to raise awareness of the challenges faced by people with disability and promote improved access to public venues. The Yeppoon Access Pub Crawl engages a group of participants who visit a number of licensed venues using wheelchairs, walkers, blinkers and other aids so that they can experience first-hand the difficulties faced by people with mobility and other impairments. ADCQ Central Queensland's Regional Manager, Ben Cooke participated in this year's event along with 14 other people from government and non-government organisations. Participants found some venues not quite as accessible as others; in most cases because the restroom facilities were inaccessible. However, overall improvement was noticed from previous years. Feedback will be provided to the establishments visited in the hope that further improvements will be made so that venues will be fully accessible to all customers. Wednesday 3 December was International Day of People with Disability. To celebrate this important day, the ADCQ Far North Queensland team hosted an Inclusive Games Day in association with Sporting Wheelies and Disabled Association, Cairns Regional Council Access and Equity Advisory Committee and ARC Disability Services Inc. The games day was a free, inclusive event open to all ages and abilities. It provided the Far North Queensland community with an opportunity to try games and activities such as goal ball, boccia, baseball, Zumba and wheelchair basketball. Members from the Cairns Hoopsnakes Wheelchair Basketball team and the Cairns Shadow Strikers Goal Ball team as well as Paralympian, Christine Wolf were on hand to mentor participants in their chosen sport. Talk the Walk panel members Ian Brown, Stephanie Perkin, Joan Sheldon AM, Mick Gooda and Sandra Phillips with an Auslan interpreter. The Commission has a leadership role in human rights in Queensland. One way we do this is by upholding, promoting and protecting the rights of Aboriginal and Torres Strait Islander peoples. We recently partnered with Queensland University of Technology (QUT) Law Faculty and Recognise to deliver Talk the Walk, a public forum on constitutional recognition. The event coincided with the 'Journey to Recognition' - an epic relay across Australia to build awareness of the need for recognition of Aboriginal and Torres Strait Islander people in the Constitution. The journey commenced in May 2013 and arrived in Queensland in July 2014. The purpose of the Talk the Walk forum was to raise awareness and provide an avenue for discussion of the constitutional recognition issue and give the public an understanding about what recognition means. The panel comprised Mick Gooda (Aboriginal & Torres Strait Islander Social Justice Commissioner), Joan Sheldon AM (former Queensland Deputy Premier), Ian Brown (Queensland Law Society President) and Stephanie Parkin, a young Aboriginal lawyer at McCullough Robertson Lawyers. Sandra Phillips from QUT provided commentary and facilitated questions from the audience of approximately 125 people. Cultural Diversity Queensland, the Anti-Discrimination Commission Queensland and the Queensland Police Service have partnered to deliver six community conversations in regional centres across the state. The first three conversations were held in Rockhampton, Toowoomba and Cairns in November, with the second round taking place in Nambour, Townsville and the Gold Coast in December. The purpose of the conversations is to let people know that the Queensland Government is committed to a Queensland where everybody feels that they belong and where racism is not tolerated. share ideas and success stories on ways to build community harmony. Participants at the Gold Coast women's group world café with Deputy Commissioner Neroli Holmes. A series of World Café style community conversations has recently commenced on the southern Gold Coast. The conversations were initiated by a group of Muslim women from the area who were concerned about fractured community relationships as a result of public debate over an application to build a mosque. The primary goal of the conversations is to bring women of various faiths together to start the process of building good community relationships. It is not a forum for continuing debate about Islam or the presence of a mosque. The focus is on broader community issues of inclusion. The first community conversation held in late September focussed on the question, How do we support this community to find the courage and vision to be inclusive? This conversation was attended by approximately 44 women including a number of local police, a local councillor, women from both Muslim and non-Muslim faith backgrounds and a local journalist. The success of the initial conversation prompted a further conversation which was held on 25 November 2014. The second conversation built on the actions that were identified at the first meeting. Questions discussed included, What are the elements of an inclusive community already happening here? and What action am I willing to take to progress the vision of an inclusive community? ADCQ's role in these conversations is to assist in creating community connections and facilitating the conversations. We welcome invitations from other community groups who are interesting in building inclusive communities through community conversations. Story list for Balancing the Act issue 36 (Summer 2014).